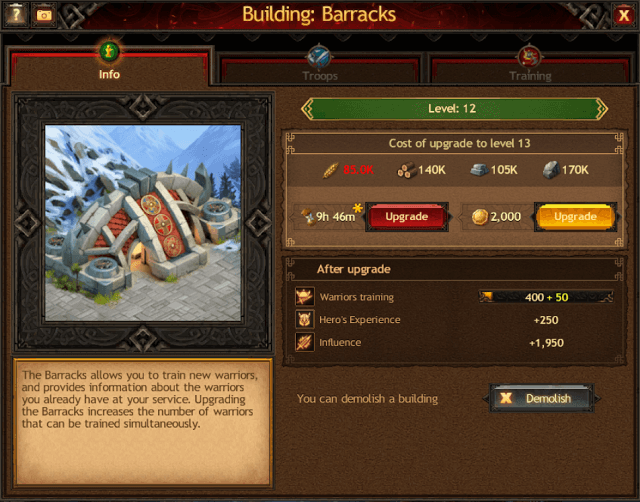 In Vikings: War of Clans, your town has many buildings that have many functions. Some of these buildings are constructed to help with the future production of your town and its ability to prosper, others have more violent ends. The latter are your military buildings and are the focus of this guide. In this guide, we are going to focus on five key military buildings that are vital to your success within the wild and dangerous world of Vikings: War of Clans. 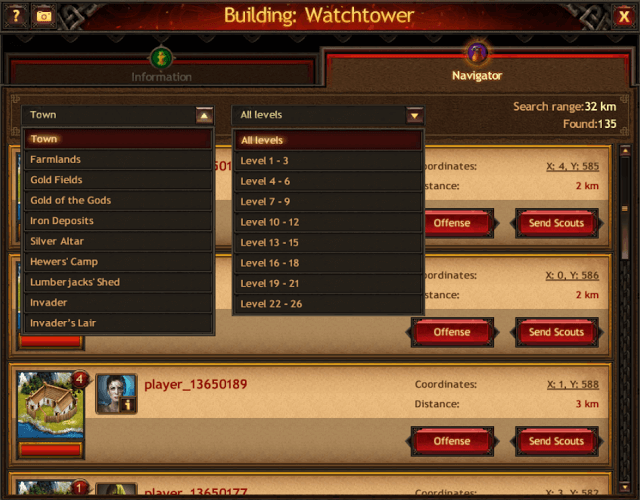 The Watchtower is a key military building that all great Jarls will strive to upgrade. There are 31 levels in total to this building, each becoming more difficult and more expensive to upgrade as you progress. The key element and benefit of the Watchtower is in its ability to alert you of incoming attacks against your town and your encampments. By increasing the level of your Watchtower, you will increase the range at which you will be able to see these incoming attacks, thus increasing your ability to respond to your enemy. You will have ample time to hide your units safely, train new warriors, or call on your fellow clansmen for aid to repel your attacker. 1–2 — Enables you to find out about an incoming attack. 3–4 — Unlocks key information about the attacking force. 5–6 — Allows you to see how much time remains before the attack lands. 7–8 — Shows the number of warriors in the attacking force. 9–10 — Unlocks the type of units in the attack. 11–12 — Rough estimation of the quantity of unit types. 13–14 — Shows whether the Hero is present. 15–16 — Displays exactly how many units are in the attack. 17–18 — Displays enemy’s bonuses from construction and Knowledge. 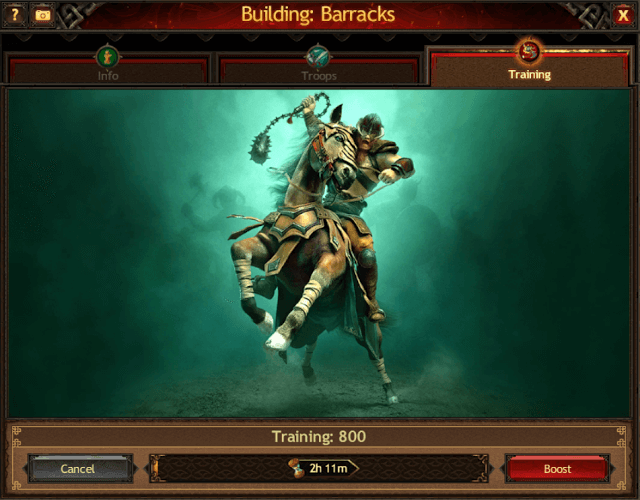 19–20 — Displays enemy’s bonuses from Hero’s Skills. 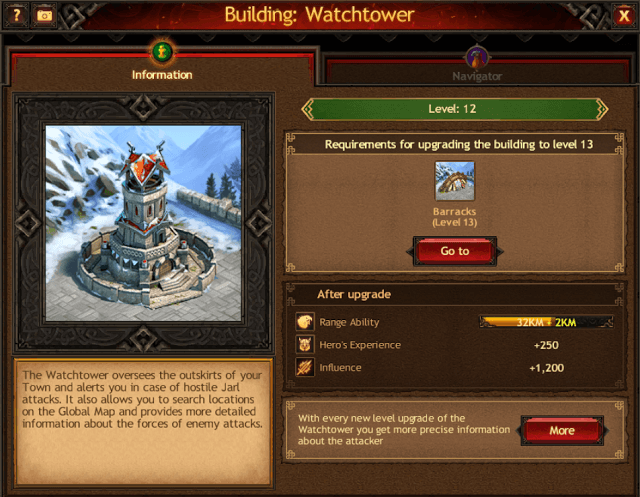 Not only does the Watchtower provide the vital benefit of seeing the attacking forces approaching your town, but it also enables you to go out into the wilderness and search for resources and new enemies on the global map. It does so using the Navigator. The benefit of this search feature should not be overlooked by any player, no matter how new or experienced they may be. It drastically cuts down on the time required to find specific locations, and thus the precious resources that will help you to emerge victorious and increase your mightiness. Next on the list is the Barracks. It is the building where your warriors are trained and their battle skills honed. This is the production center of war, and is necessary for those who wish to become a powerful and mighty Jarl. In the Barracks, you have three tabs, as seen above. The first is the Information tab, which allows you to see the number of warriors you can train, the cost of upgrading, Hero’s experience reward, and Influence — all based on the current level of your Barracks. The next tab in the list is the Troops tab — the most important tab. In this tab, you can see the different types of units you can currently train, and those that you can train in the future. There are six types of troops in total: melee, ranged, cavalry, killers, siege troops and scouts. 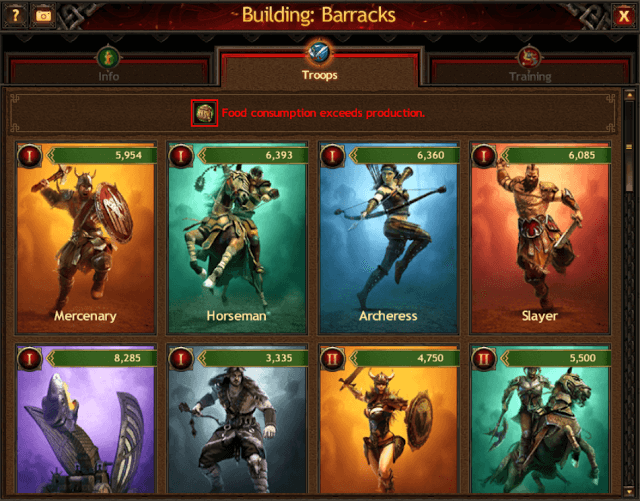 As you can see on the screenshot above, the warriors differ not only by type but by tier — a level marked with a Roman numeral. Each subsequent tier is stronger than the previous one and has higher stats for offense, defense, health, etc. At the early stage, you can train only tier I warriors. Then you will have access to the next tiers by unlocking in turn the corresponding Knowledge in the Oracle (we will cover this in detail in another guide). The third tab is the Training tab. Here you can see the training of specific warriors that is currently in progress, the number of warriors in training and the time left until training is complete. You should check this tab regularly so you don’t miss a chance to add new strong warriors to your army. The Barracks is a vital building in any Town, and one that you must always use to its full potential if you wish to repel enemy attacks and capture rewards when fighting your foes. The Infirmary is one of the key buildings in the Town. If you sustain casualties in a battle with your opponent, this building determines the fate of your troops. They will either continue to live on and fight, or face total destruction. The Infirmary allows you to heal warriors who have fallen in the defense of your Town, and to resurrect those ones who died valiantly in battles with enemies. After clicking on the Infirmary building, you will see a window with three tabs. 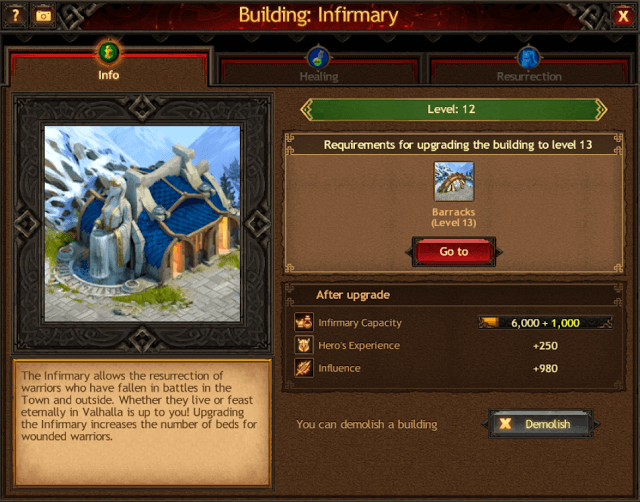 The Information tab displays the most important information: Infirmary capacity, upgrade cost and reward for reaching the next level. The next tab is Healing. Here you can see the number of troops wounded during the Town’s defense that you can heal (it depends on the total capacity of all Infirmaries). To start healing, you need to select the number of units you wish to heal and the healing method: instantly for Gold or over a certain time for game resources. 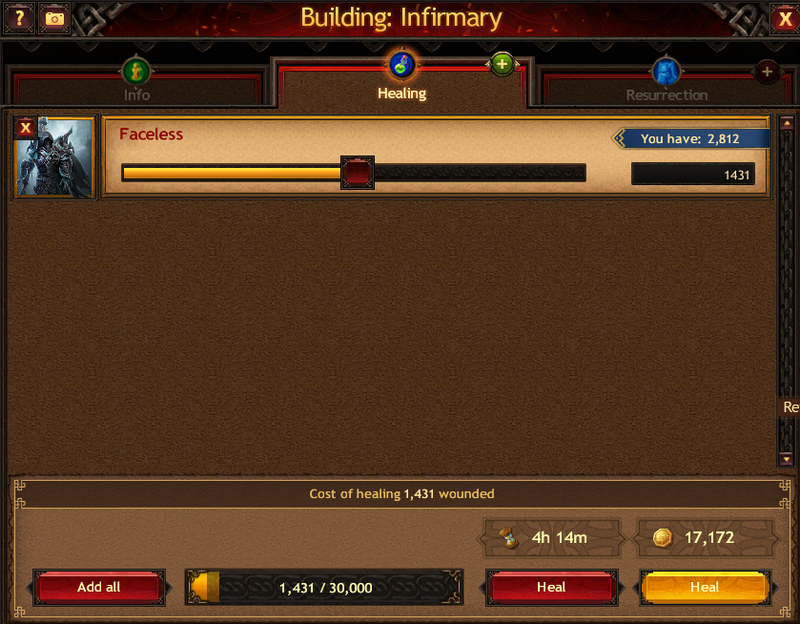 The Resurrection tab allows you to revive troops who died in deadly battles outside your Town, and 70% of warriors for whom there wasn’t enough space for healing. You can resurrect them for Gold up to a week after the battle. It is important to constantly level up your Infirmaries, so your warriors always come back, no matter how grand and bloody the battles may be. You should also remember that you can construct several Infirmaries, thus increasing the maximum number of warriors you will be able to save in the future. The next building we are going to discuss is the Mead Hall. At first you might think that it only defends your Town from enemy attacks, but this is not true. Wise Jarls use the Mead Hall to develop victorious strategies and to crush enemies. 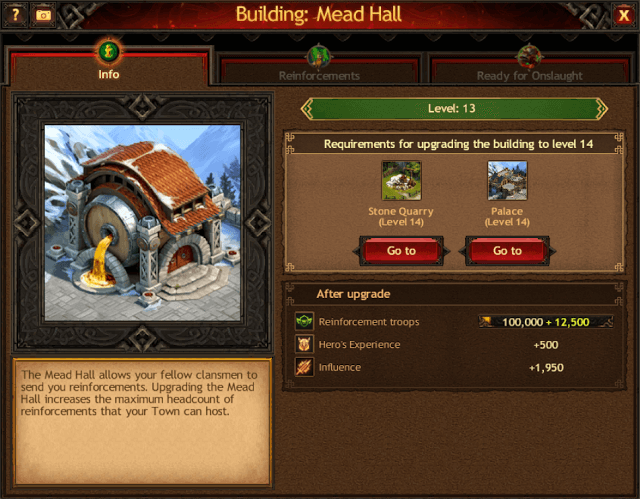 The Mead Hall is a building where you can accept reinforcement troops from your clansmen. Reinforcement troops that have arrived to help defend your Town are displayed in the Reinforcements tab. Moreover, if you have activated a Peace Treaty, you can hide the troops of your allies in your Town. This means that they will be under the Peace Treaty without any cost to them and will be protected from enemy attacks and espionage for a certain amount of time. One more advantage of the Mead Hall is that you can join forces with your clansmen in order to increase the offensive power of your troops and crush an enemy. 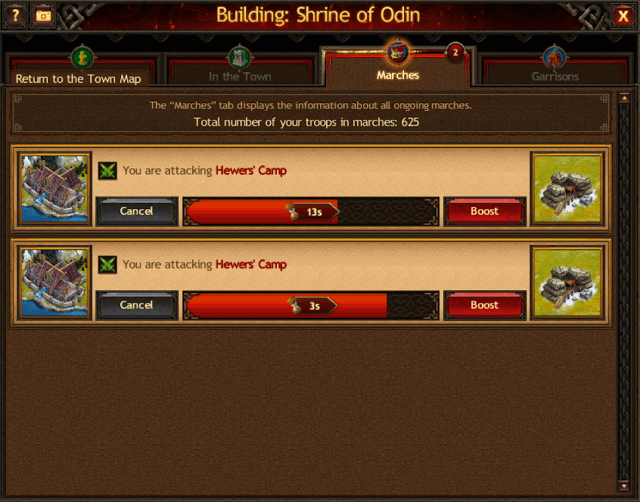 The Ready for Onslaught tab displays troops sent to your Town for a planned joint attack. The Mead Hall has a total of 31 levels. With each level, the requirements for upgrading the building and your Influence become higher. The Mead Hall is a useful and multipurpose building that allows you to significantly increase your Town’s stats and draw even closer to unprecedented greatness. The Shrine of Odin is the sanctuary of the greatest northern god and is named in his honor. There is no Jarl in the harsh world of Vikings: War of Clans who can crush their enemies and reach the pinnacle of mightiness without this vital military building. The number of marches your troops can be simultaneously sent on and the number of warriors in a march is determined by the current level of the Shrine of Odin. 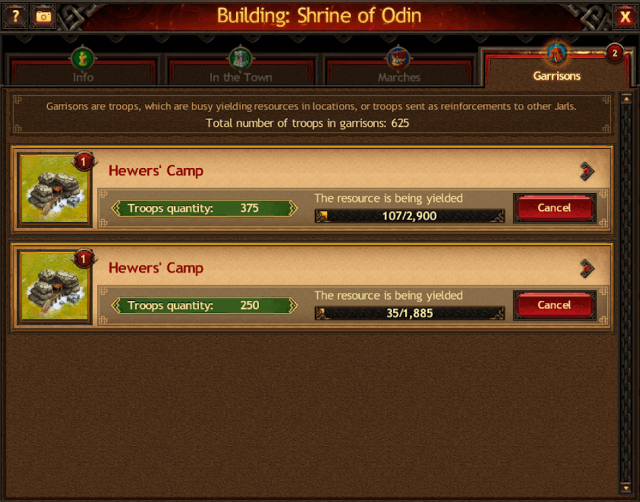 By upgrading the Shrine of Odin, you get many opportunities for new conquests and the further development of your Town. Besides the Info tab, where general information about the Shrine of Odin is displayed, you will also find the In the Town, Marches and Garrisons tabs in this building. The In the Town tab displays the total number of troops that are currently in the Town, including reinforcement troops from your allies. In the Marches tab you will see where your warriors are marching to and when they will reach their destination. And, finally, the Garrisons tab displays troops that are out of the Town — at resource locations or as a reinforcement in a clansman’s Town. Here you can find out their types and number and — if they are yielding resources — the time left until the yielding is over. 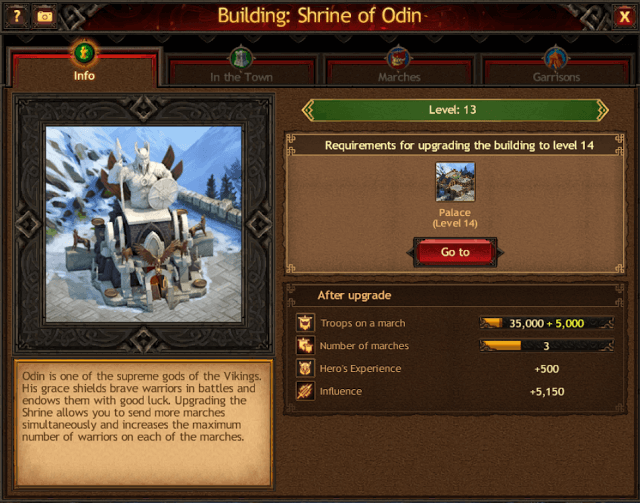 Like other buildings, the Shrine of Odin can be upgraded up to level 31, and each subsequent level is more difficult to reach and requires more resources. In conclusion, the military buildings we have told you about fulfill very important functions. They are all vital to the further development of your Town and conquest of your enemies. All great Jarls should be focused on further increasing the level of these buildings, so they can better defend themselves and their fellow clansmen in the countless wars that they are surely set to face in the wild and dangerous world of Vikings: War of Clans. Play Vikings: War of Clans NOW!